Something is up on the Facebook vs. Google data reciprocity front. It looks like Facebook is removing Gmail from the list of third party email providers on “Find Friends”, whereas we were seeing direct link downloads to Gmail contacts still offered as an option just a couple of days ago. It gets stranger. Some new users who sign up with their Gmail accounts can still see the option to add friends from Gmail, but when I tried to import contacts I got the below “Everyone on this contact list is already on Facebook or has already been invited” message. In other words it didn’t work. Signing up with a non-Gmail account eliminates the option entirely even though you still have the capability to manually download and upload your contact files. This seems to be the latest development in the ongoing Facebook vs. Google slap fight, even though it’s not exactly clear who slapped whom. Google No Longer Claims Facebook Will “Trap” Users. Or Do They? I’ve contacted both Facebook and Google for more information and will update this post when they respond. For the record, Mark Zuckerberg called Gmail Priority Inbox “pretty cool” onstage at Web 2.0 Summit after Facebook announced their own email product last week. Update: Word from Google is that nothing has changed from its side. 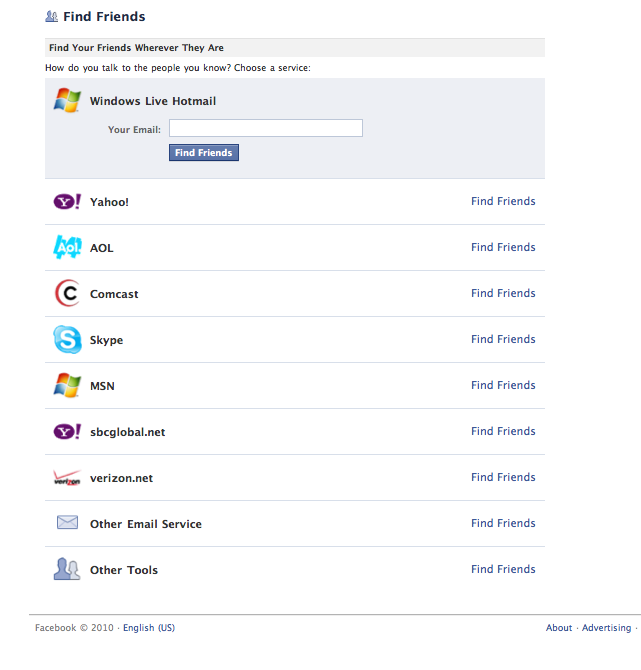 Atul Arora also points out that the Gmail contact import button is now gone from Facebook property Friendfeed as well.